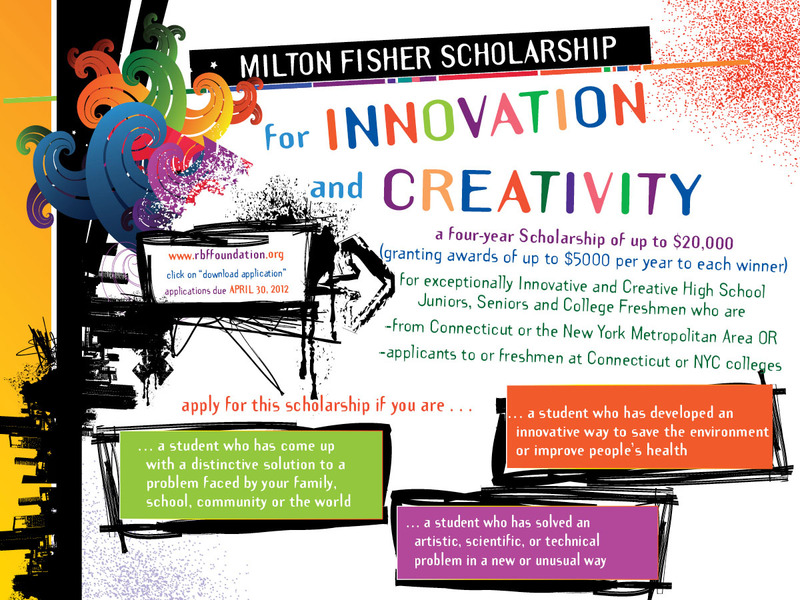 $500+ Milton Fisher Scholarship for Innovation & Creativity. Renewable scholarship for exceptionally innovative and creative high school juniors, seniors, and college freshmen who are graduating or have graduated from a Connecticut or New York City metro area high school (and plan to attend or are attending college anywhere in the U.S.) or are graduating or have graduated from any high school in the U.S. who plan to attend (or are attending) college in CT or NYC. You must graduate from a high school in the U.S. and complete an exceptionally innovative and creative project: solved artistic, scientific, or technical problems in new or unusual ways, come up with a distinctive solution to problems faced by your school, community or family or created a new group, organization, or institution that serves an important need. For more information, please contact Rbffoundation.org via this link.